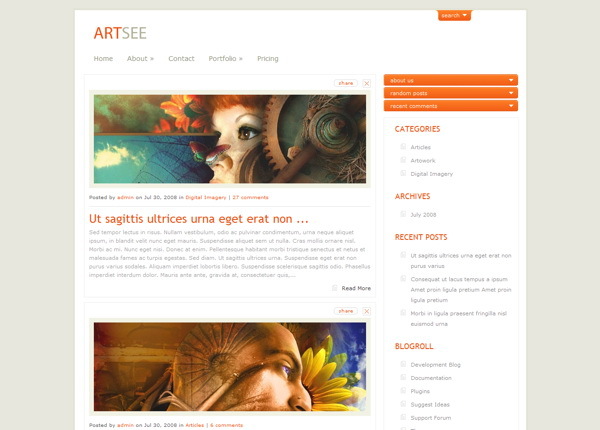 ArtSee is an artsy design that was made for those looking for a simple and elegant theme. This template is perfect for portfolio websites, or blogs that seek a design that will accentuate visual imagery rather than overpower it. This theme comes with custom options pages that makes it editable via wp-admin – no CSS knowledge required. Designing and organizing your posts has never been easier with this theme. With our large collection of shortcodes you can create beautiful and complex layouts with ease, greatly improving the functionality and variety of your content. This theme has been localized for easy translation. Using the theme’s MO and PO files, you can quickly translate the design without having to hunt through the theme’s PHP files to change each word.